Coming from its initial debut in 1999 on the N64, Super Smash Bros. has come an amazingly long way. After launching with 12 initial characters from Nintendo’s favorite franchises — such as Mario, Link, Pikachu, Donkey Kong, Samus, and more — this generation’s installments of Super Smash Bros. for both Wii U and 3DS have taken 15 years of smashing, melee, and brawling to a whole new level in its character roster, gameplay, and the sheer fun of seeing Nintendo mascots beat the hell out of each other. Thankfully, that sheer fun hasn’t been diminished since then: instead, it’s been amplified. Coming from the collaboration of the original game director, Masahiro Sakurai, alongside Bandai Namco, Nintendo’s latest iteration of its long-running mascot combat series is now coming to Wii U and 3DS, with the 3DS version being the first installment to debut. Following previous series entries on the N64, GameCube, and Wii, Super Smash Bros. for 3DS not only boasts its release ahead of the anticipated Wii U version, but also claims a historic spot as the first Smash Bros. title to arrive on Nintendo’s handhelds. As every Smash Bros. title has been a pretty hefty package, how does the latest entry hold when shrunken down to 3DS scale? It works almost perfectly, in fact. Like previous titles in the series, Super Smash Bros. for 3DS collects characters from across the Nintendo universe together to engage in epic (handheld) battles, with the latest iterations boasting over 40 characters from Nintendo’s mainstay series such as Super Mario Bros., Pokemon, The Legend of Zelda, Fire Emblem, and far more than you can expect to see in just one sitting with the game, and enough to make any Nintendo diehard giddy with glee. 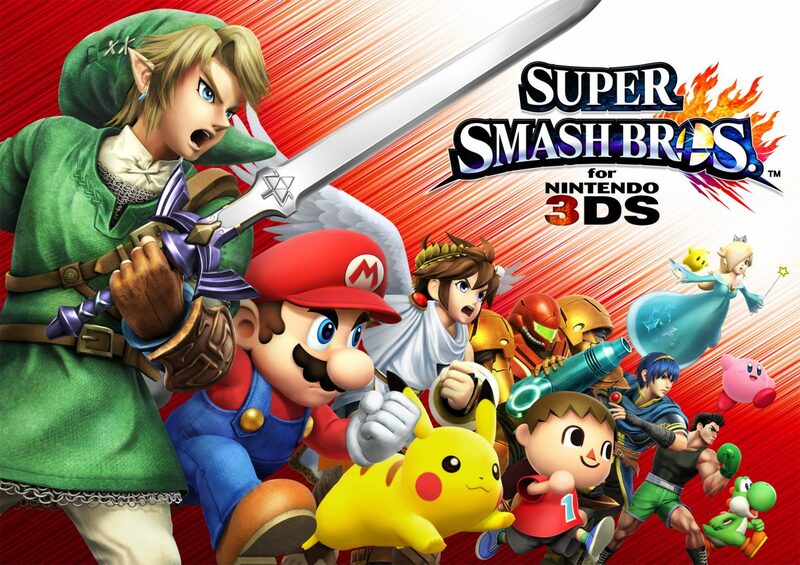 As a combination of a fun party game, a surprisingly intense competitive fighter, and a bonafide Nintendo history lesson, Super Smash Bros. for 3DS retains all of the elements that make each and every Smash Bros. game an event when released, and also works in several new modifications and tweaks to support its unique placement on the 3DS, as opposed to the home console versions. Pitting one to four players as various characters from Nintendo’s franchises, the name of the game is to use a character’s attacks, abilities, and a little bit of strategy to attack opponents, raise their damage percentage meter, and knock them clear off the stage. Including characters from the mix of several Nintendo properties, more than ever the title features an eclectic range of fighters with unique play styles and abilities, giving strategy and depth to the easy pick up and play experience that the Smash Bros. games have been so well known for, and so good at. 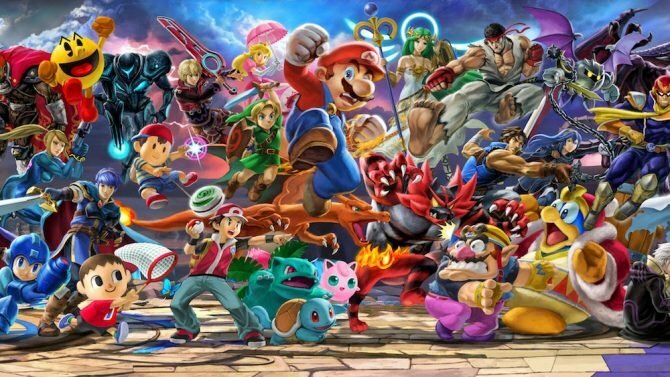 Of course, it wouldn’t be a Smash Bros. game without its eclectic lineup of Nintendo mascots ready to beat the living crap out of each other, and with the series’ largest character roster to date, there’s more opportunity for that than ever. Whether it’s in a Fire Emblem grudge match between Marth or Ike, or assembling the dream team showdown between Mario, Pac-Man, Sonic, and Mega Man, the character roster is not only expansive and filled with tons of different characters to try out, but also richly diverse and full of unique combatants that bring plenty of new techniques and abilities to the fighting ring. Starting with the veteran characters — returning champs like Mario, Link, Pikachu, Donkey Kong, and many others from previoustitles — which have largely remained the same, providing a stable of easy to pick up characters for newcoming players. Mario’s jack-of-all-trades abilities make him a good well-rounded character, Donkey Kong is good for some heavy-hitting beatdowns and etc. Though the familiar characters haven’t changed a whole lot since Super Smash Bros. Brawl, it’s good to know that at least some characters will be easy to pick up for newbies. Likewise, other returning vets from previous installments, such as Meta Knight and Pit, have had slightly more radical changes to their movesets and style, with Pit getting a few more heavy-hitting attacks at the price of his speed and mobility, and with Meta Knight receiving a few tweaks to his abilities, but having still much of the same power and swiftness that made him so deadly back in Brawl. While none of the returning characters have had completely revolutionary changes, the tweaks and alterations that are present with some of the past favorites turn more toward refinement and balance than anything else. As Sakurai is well-known for his tenacity in achieving good character balance, the changes that have been made to both the characters may make some of their strategies and styles a bit different than in previous games, but serve overall to modify several characters that did need some changing up a bit previously (such as Meta Knight and Ike). 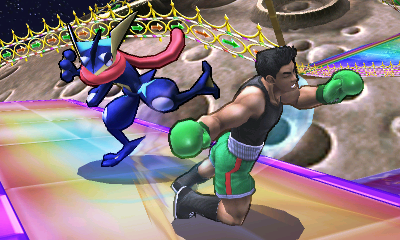 In addition to a few major gameplay revisions, such as the removal of gliding and the infamous tripping mechanic from Brawl, 3DS successfully manages to straddle the line between the fierce competitive speed of Melee, while also keeping the slightly more casual edge from Brawl, keeping the essence of the game intact. Though the return of the (many) familiar faces from previous Smash Bros. is well worth the experience, the highlight of a new title is always the new challengers that approach, and 3DS is no slouch in this way. Bringing plenty of first timers to the series, such as Punch-Out! !‘s Little Mac, Pokemon X & Y‘s Greninja, Animal Crossing‘s Villager, and the long-awaited arrival of iconic classics Pac-Man and Mega Man, the new characters bring as much strategy and new tactics to the ring as much as they bring exciting nostalgia. Pac-Man’s power pellet-powered attacks give him both speed and power in a variety of situations, while Mega Man’s assortment of weapons coming from his classic games lend him a tool for nearly every encounter (along with easily the coolest Final Smash in the entire game). In particular, Punch-Out! !‘s Little Mac offers a truly unique play style with a heavily ground-focused game: his punches and swings bring massive damage with his feet planted on the ground, but heading into aerial combat leads him to weaker attacks and even poorer recovery. Bringing plenty of other new characters with unique play styles, such as The Villager’s use of trees and bowling balls to attack, Fire Emblem: Awakening‘s Robin using a tome of spell books and magic, the roster in Super Smash Bros. is easily the most diverse the series has seen yet, leading to hours that can be spent just going in and learning the ins and outs of how each character plays. Though some characters, such as Robin and Xenoblade Chronicles‘ Shulk, do require a bit of finesse and practice time to learn some of their more complicated maneuvers and combos, the new fighters do bring plenty to the ring that make coming back for another round exciting and different each time. Though it comes in a small 3DS cartridge, 3DS comes bursting with game modes, features, and more to always provide players with something new to try out and explore. Aside from the standard “Smash” mode where the battles begin (with an assortment of customizable rule sets and options), the game also gives a variety of game modes and options for both single-player and multiplayer types, in local and online battles. Those who are looking for solo options can find solace in the game’s newly-revamped “Classic” mode, where players engage in a series of six battles against random characters. This time around though, difficulty is measured on a new slider that will be familiar to players of Sakurai’s previously-helmed Kid Icarus: Uprising. After setting the difficulty slider between 1.0 (Easy) to 9.0 (Hardest), the scale then adjusts how many coins players will wager toward successful completion of the mode, lending higher stakes (and higher financial reward) to the traditional “Classic” template Smash Bros. has used in the past, freshening up the mode a great deal. 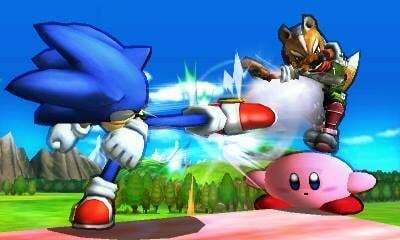 Though the Wii U version of the game is around the corner, one of the major highlights of the 3DS version of Super Smash Bros. is the new “Smash Run” mode, a sort of mix between the previous games’ “Adventure” modes and a more time trial-based speed run. Playable either in single player or local multiplayer, Smash Run pits one to four players in a massive stage with randomly generated enemies, giving the combatants a five-minute time limit to smash as many baddies as possible, leading to collectible power ups with stat-altering effects toward Speed, Jump, Special, Attack, Defense, and Arms. Once the five minutes are up, players are then thrown into battle with their powered-up abilities and stats into a random match-up or game type — whether this is a regular Smash battle, an item based Smash battle (Warp Star Battle, Mr. Saturn Battle, etc. ), or a more elaborate competition, ultimately comes down to fate. Though Smash Run may not be a lengthier Adventure Mode, or something as elaborate as The Subspace Emissary campaign from Brawl, the mode fits perfectly into the 3DS mold with a short gameplay experience that’s always unique. Keeping its portability in mind, Smash Run is not a major game-changer in the breadth of 3DS‘ many game modes and challenges, but it serves as an effective change of pace from the regular brawling, and it wouldn’t be surprising to see players take a dip into Smash Run in between several dozen rounds of Smash battles. As the first portable Smash Bros. experience coming from Nintendo, it largely succeeds at bringing the epic scale and plethora of content from previous Smash Bros. titles and shrinking them into a smaller scale. 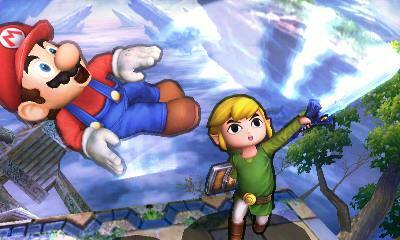 With the focus of the title being more on customization and a personal experience, technically-speaking Super Smash Bros. for 3DS translates effectively well on handhelds with its short-paced gameplay, making it an excellent companion for commutes, trips, or just lounging around and ready to smash a few rounds. At a smooth 60FPS, graphically the title looks (and plays) tremendously, with control options being fully customizable (an option I used myself to customize the game to my likings) and other graphical options, (such as the character outlines unique to the 3DS version, being changeable and tweak-able to the player’s liking) as well. While the game itself plays and looks great, some of the limitations of the 3DS itself do arise often, the most notable being the smaller screen size presenting some unique challenges in bringing Smash Bros. to handheld. Given the often frantic pace of the gameplay and details in the stages, the largest obstacle to overcome in playing the game is the 3DS’s smaller screen making it somewhat of a challenge to keep track of what is going on and what is happening on-screen. Even while playing and reviewing the title on a 3DS XL, it did sometimes become a bit of a challenge to keep track of where my characters where during a match, especially in the middle of more hectic four-player matches where screen space becomes limited very quickly — a problem that can only be magnified by playing on the smaller original 3DS or 2DS. 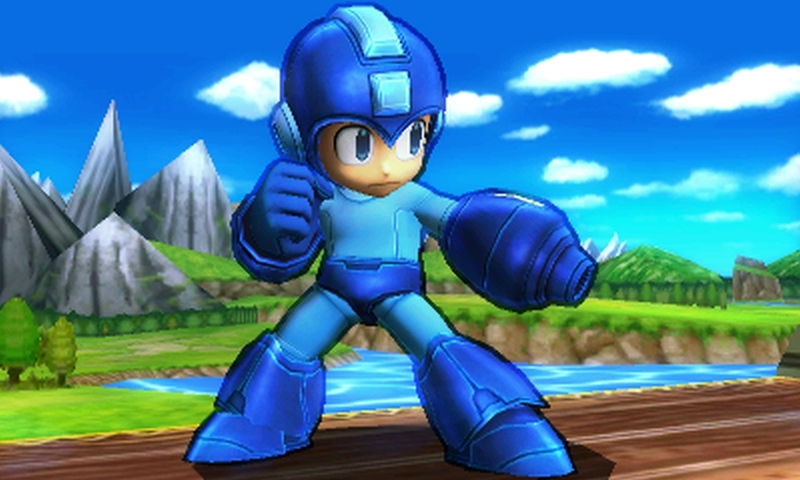 Although the screen size does glare as one of the bigger drawbacks to the game’s handheld iteration, many of the game’s design choices do at least service the setback to make it less apparent, such as a collection of stages that mostly are on the smaller end to keep the action tight, along with character outlines (that also change color when in team battles) that help to keep players focused on their own character, even among the more hectic carnage. Coming from a collection of just 12 characters and having now expanded to a roster of nearly 50, Super Smash Bros. for 3DS takes the epic action of Nintendo’s flagship fighting series and makes it grand on a smaller scale. 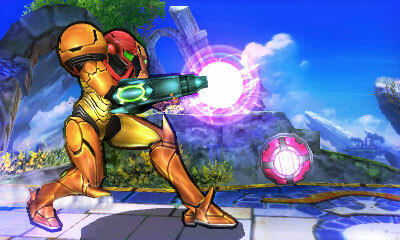 Though some of the limitations of the hardware and console do get in the way with its smaller screen, and the looming presence of the New Nintendo 3DS’s C-Stick and faster processor may mean some “enhanced” features for the game next year, the 3DS title doesn’t let its smaller scale impact its experience at all: it’s a complete Smash Bros. experience all its own. 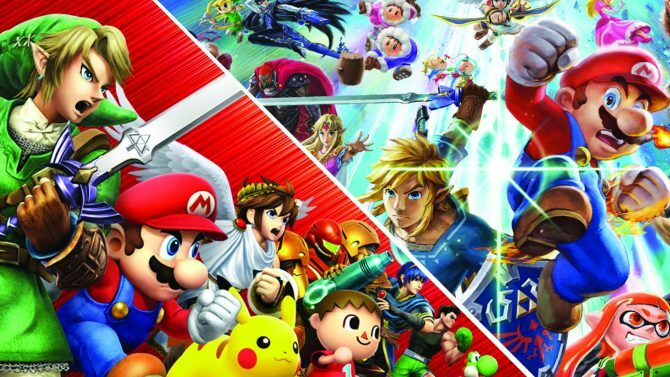 With a bevy of game modes and options to always keep the experience fresh and a rich, diverse roster that bring as many moves and play styles as they do heartwarming Nintendo memories, it adapts the addicting gameplay and variety of previous Smash Bros. titles into a knockout little package. Though it may lack some of the heftier features of previous titles with no long-form Classic or Adventure Modes, Super Smash Bros. for 3DS instead opts for truly-refined and lean gameplay that not only works well for the portable platform on 3DS, but proves to bring some exciting new additions like Smash Run just as engaging and fun as the regular bouts of brawling in the ring. 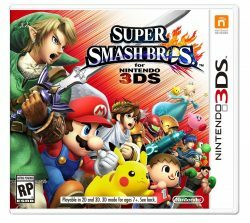 As a love letter to Nintendo fans, Super Smash Bros. for 3DS brings together the best of gaming into one of the best 3DS games available, and although the portable title may be a warm-up for this holiday’s Wii U version, it will be hard not jumping back in for a few more practice rounds on the 3DS. With the release of Super Smash Bros. Ultimate, let's take a look back at the entire series' development, history, and lasting legacy.